Available from diameter 80 mm up to diameter 630 mm. Different profiles for pipes and components with 1 mm, 2 mm and 3 mm wall-thickness. Available in galvanized steel. Inside the pull-ring there is a sealant being physiologically safe and temperature resistent up to 80 degree C.
Application: gravitational bulk good conveying and de-dusting and air extraction plants with pressure differential up to approx. 5000 Pa (500 mm water gauge). If higher pressure tightness is required please use pull-rings for U-shaped seals. 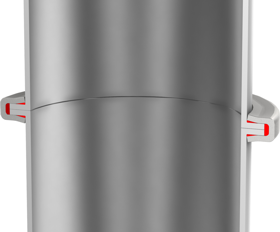 The connection is shock explosion proof up to 3 bar overpressure when using pipes and components up to diameter 300 mm with galvanized pull-rings (certified). When using pull-rings made of stainless steel, the tightness against shock explosions is increased up to 6 bar. Available from diameter 80 mm up to 400 mm. 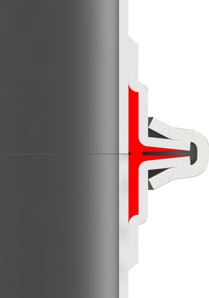 Same profile of pull-rings for pipes and components with 1 mm and 2 mm wall-thickness. Available in mild steel galvanized and stainless steel. 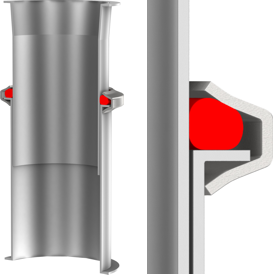 In order to make the connection tight a U-shaped seal for 1 mm or 2 mm thick pipes and components is required, which has to be slipped over one of the machine-lip flanges. U-shaped seals are available in various qualities due to different chemical and thermal consistences. 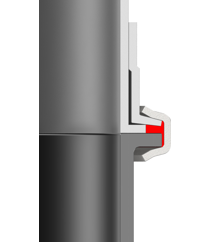 In order to make the connection tight a U-shaped seal for 1 mm or 2 mm thick pipes and components is required, which has to be slipped over one of the machine-lip flanges. U-shaped seals are available in various qualities due to different chemical and thermal consistences. The connection is condensate tight. Leakages are far below the admissible values (acc. to DIN 24194, tightness grade IV - for conveying systems with highest requirements). It is shock explosion proof up to 3 bar when using respective pipes and components (1,5 mm - 2 mm wall-thickness) up to diameter 300 mm (certified). Pipes and components with a larger diameter than 300 mm can be used with a loose-flange connection (which is certified up to diameter 630 mm). The conventional working pressure for the pull-ring connection with U-shaped seal is up to 250 mbar = 25.000 Pa = 2.500 mm water gauge. In order to create special length when assembling. In order to connect the push-in pipe with a normal pipe a pull-ring or a QUICK CONNECT® pull-ring without sealant for 1 mm + 2 mm and a ring-seal are required. The connection is not shock explosions proof. Admissible pressure differential inside the pipe system is 100 mbar, higher values on request. The connection is not suitable for axial loads, the pipes and components have to be protected against dislocation when having a higher pressure differential. Available from diameter 350 mm up to 1600 mm, for pipes and components with 1 mm up to 3 mm wall-thickness. Available in mild primed steel, mild galvanized steel or stainless steel. 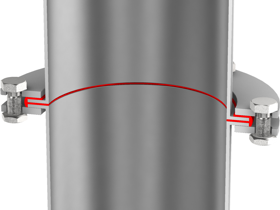 To make the connection tight a u-shaped seal is required, which has to be slipped over one of the 10 mm high machine-lip flanges. U-shaped seals are available in various qualities and suitable up to 200 degree C.
The flange connection is shock explosion proof up to 3 bar when using respective pipes and components up to diameter 630 mm (certified). Pipes with welded-on flange on request. Available from 80 mm to 300 mm diameter pipe parts in 2 mm and 3 mm wall thickness, primed. Version 2 mm stainless steel on request. Certified up to 300 mm diameter explosion-proof up to 10 bar pressure. The pipe sections got no machine-lipped ends as our standard parts, but it will be a flared angle flange welded on. The seal is applied in the factory on the angle flange. Advantageously used for the transport of abrasive materials, as the high-risk joints between the pipe sections are enhanced by the flared angle flanges. Our 7.5 mm thick segments (bends) of nodular cast iron for wear endangered deflections can be directly attached to a pull-ring for cast iron on the flared angle flanged pipework. Thus, even for a connection of the machine lippe-end pipework to cast iron piping should be done with a welding end with a flared angle flange or alternatively with a welded-on flared angle flang. Only when subsequently a lipped-end steel segment has to be replaced by a cast iron segment There should be used a loose splitted flared angle flange to compensate the external diameter.